Do you know this feeling? You enter a room and find it uncomfortable. Maybe you feel the room is too noisy, have difficulty following a conversation, detect a dull pressure on your ears, or feel tired? The causes can be due to the acoustics of the environment. Noises are amplified through reflection and can create an unpleasant acoustic climate. Depending on the frequency and sound pressure level, background noises can be tiring to our hearing and ourselves. In this article, we will take a closer look at these three causes, describing how they can be measured and how they can be reduced. Road traffic, construction sites and aircraft are among the most frequent sources of external noise. These penetrate through façades and windows in offices and apartments and can lead to anything from discomfort and insomnia up to mental health problems and diseases. Although efforts may be being made to reduce the noise sources themselves, these efforts are often physically or financially constrained. As a result, the noise-stricken population may see only slight attenuation of the incoming sound. To measure how effectively noise has been reduced, a standardized measurement for façade sound insulation is used. This term refers to the ability of a façade to protect the interior of a building from outside sound. For this measurement, a powerful loudspeaker is aligned in front of the façade. The difference in the measurement data from two microphones – one in front of the façade and one inside the building – is used to calculate the sound insulation value. Typically various sounds are created inside a building. Some are generated by people (talking, music, construction noise), others come from fixed machinery or equipment (ventilation, heating, washing machines, etc.). Structure-borne noise spreads in the form of vibrations from impacts on the structures (i.e. the walls and floors), e.g. tapping or drilling noises. It is necessary to separately determine the airborne and impact sound insulation between the individual rooms. Two measuring methods have been established. Similar to our determination of façade sound insulation, airborne sound insulation is measured using a relative measurement. A reference sound source is placed in the first room (sending room). The levels are measured in this room and in the next room (receiving room). 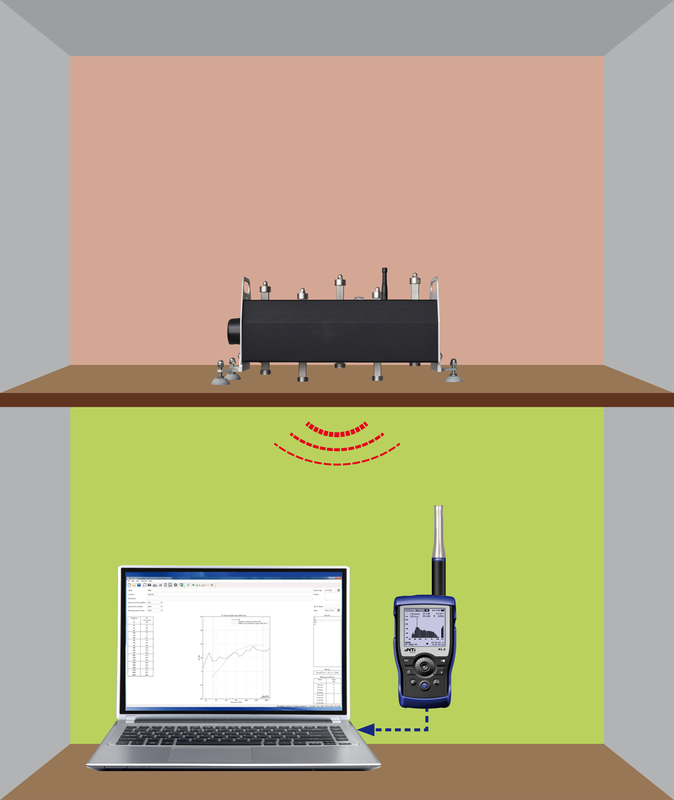 From the level difference of these two measured values and the reverberation time of the receiving room, a result is calculated for the airborne sound insulation. This is an absolute, rather than a relative measurement. A calibrated tapping machine is placed on the floor, and the impact sound generated is acoustically measured in the room below (or the room next door). Again, together with the reverberation time of the receiving room, a result is calculated for the impact sound insulation. In combating noise within a building, consideration of the particular type of sound transmission is important. In the case of airborne sound, the cure is primarily in the installation of sound-damping and/or diffusing materials. With structure-borne noise, isolating the point of impact with, for example, a floating floor or similar, may provide the solution. The third aspect, which is extremely important for the feeling of well-being in a room, is an examination of the room’s acoustic properties. The decisive factor is the reverberation time, i.e. the length of time that it takes for sounds generated in the room to decay (“fade away”). Specifically, the “RT60” value is determined, which measures the time it takes for a sound that has been abruptly ended to decay by 60 dB. In general, there is a “comfort band” for the acoustic climate of the room, because both very short and very long reverberation times make the room uncomfortable. In an office, for example, reverberation times of 0.5 – 1 second are appropriate, while for rich and warm-sounding concert or opera halls, reverberation times of 1.5 – 2 seconds may be preferred. A sufficiently quiet environment so that the reverberation time can be reliably measured at all. Generating a sufficiently loud, broadband test sound (broadband means that the sound has enough low, mid and high-frequency components). For the measurement itself, the sound source is first set up in a suitable place. Standards, such as the ISO 3382, specifies that a distance of at least 1 meter should be between the measurement microphone and reflective surfaces such as walls, floor, and tabletops, etc. It is recommended to position the sound source at a height of 1.5 meters. The height of the source and the microphone shall be the same. Lastly, the minimum distance between source and microphone shall also be at least 1.5 meters. For exact details, always refer to the ISO 3382 Standard. Now the measurement can begin: the sound source is repeatedly activated and turned off while the meter measures and averages the reverberation times. It should be noted that, especially in larger rooms, several measurements should be done, with periodical changing of the positions of both the sound source and the meter. In practice, the time taken for a level drop of only 20 dB (T20) or 30 dB (T30) is measured. This time is then extrapolated to 60 dB. The reason for this is, due to unavoidable background noises and the required reserves in sound pressure levels, an enormously loud test signal would have to be generated for a full 60 dB level drop measurement, which is often not feasible. The test sound signal is important. The noise must first be loud enough to allow a reasonable measurement. In practice, sound sources should be capable of producing 120 dBSPL, such as, e.g. Sound sources that produce a loud bang, such as a starter pistol, a bursting balloon or a clapper board. IMPORTANT Since very high sound levels are necessary for reverberation time measurements, it is strongly recommended that you always wear adequate hearing protection! At the end of a series of measurements, the meter should display the reverberation times per third octave band, with two additional parameters: the correlation and the measurement uncertainty. The correlation indicates how linear the measured level drop is. In practice, various influences can cause the level to drop erratically, such as a non-uniformly shaped room or sporadic background noise. The meter should recognize this automatically and inform the user accordingly. On the other hand, the calculation of the measurement uncertainty is based on a standardized procedure that takes into account the measuring bandwidth, the duration of the reverberation time measurement (T20 or T30) and the number of measuring cycles. The lower the measurement uncertainty, the more precise the result. How relevant are the results of measurements taken in a deserted room? Consideration must be given to the fact that the human body absorbs sound, and thus the absence of people will increase the reverberation time. This is particularly evident in rooms designed for a large number of visitors, e.g. classical concert or opera halls, although well-padded seats do a pretty good job absorbing sound. As the sound signal used during measurement needs to be loud, it is generally unacceptable to perform a reverberation time measurement in a fully-occupied location. The solution to this is to reduce the reverberation time measured in empty space. Although the amount of this correction value can be determined by complex simulations, in practice it is mostly determined empirically by the acoustic expert on the basis of the circumstances and empirical values. Acoustic surfaces (such as concrete walls & ceilings, windows, table tops, etc.) reflect the sound, resulting in higher reverberation times. Sound absorbing materials (e.g., curtains, carpets, special panels) reduce the reverberation time. The necessary elements are ideally already provided during the planning phase of a room construction, but at the latest after the completion of the room installation. Another measure would be to create exits for the sound (for example open windows). This allows the sound generated in the room to escape instead of being reflected. Unfortunately, this is often impractical because of climatic conditions or external noise.